Quick, what can you do with some metal sheeting, LEDs, a mirror, and wire? Make a lamp, of course! 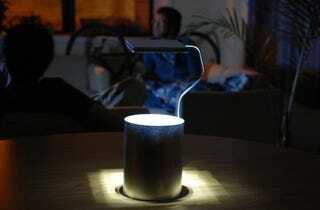 Yanko posted this simple, but functional, Nimbus Reading Lamp, created by Donell Huston. Essentially, Huston has the LEDs in the base of the lamp shining up into an angled mirror, which reflects on to the table surface in front of the user. The metal sheeting helps project the light upwards, and the wire holds the mirror in place.